There are many factors that determine whether your haircut is a success or a disaster. We all know the basics — bring in multiple pictures and take the time to communicate what you want. But, as this Huffington Post article points out, the fate of your 'do might rely on a technique that's slowly gaining popularity: the dry cut. Whether you get your hair cut wet or dry really does make all the difference. 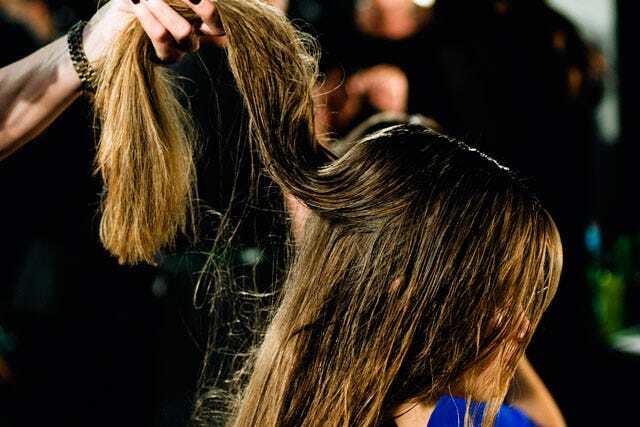 For one thing, as the article states, "Dry cutting lets hairstylists see the shape of the hair as they cut it, instead of waiting until they blow it dry." And, that means you can see the shape of it, too. Meaning, you can speak up before your request for a short bob turns into a pixie. That's not all, though. Dry hair is a completely different beast than wet hair. Cowlicks, bends, waves, and all the other little quirks your hair has aren't visible when wet. With dry hair, your stylist can work with those unique features to give you the best cut. Doesn't that sound like something we all want?